Hello again! Today is the second day of the Gina K Designs stamp previews. Today the design team is working with Melanie's newest set called Arranged with Love and a new set from Nina called Bug Me Anytime. Here is a little journal I created with Arranged with Love. This set comes with a gorgeous HUGE background stamp that has a little journal box built in. 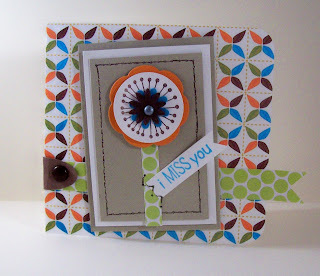 There are many scripted sentiments to add in-- so it is easier than ever to create simple but stunning creations. For this journal, I chose to layer the sentiment from Say it with Flowers over the background. The background is also trimmed a bit on top and bottom to fit the journal front. To make it look like it was uncropped, I simply cut the stamped image to the size I wanted and then took a black marker and a ruler and re-drew the border along the edge. I then colored the background with Copic markers, and then added the sentiment and matted it on more Pure Luxury white and black onyx cardstock. All of the ribbons used on this project are from Gina K Designs Stamp TV kits. As a final touch, I stamped the background in red ink on white cardstock and rolled it up to fit inside a R.S.V.P. pen. Materials used: Stamps-Arranged with Love, Say it with Flowers (Gina K Designs); Memento black ink; copic markers; cardstock-white, black onyx (Gina K Designs); Pink (Prism); ribbons (Gina K Designs, from Stamp TV kits); journal (Michael's $1 spot); red ink (SU! ); R.S.V.P. pen (Pentel); brads (Gina K Designs); Spellbinders Labels 4 and Long scalloped rectangles; Cuttlebug (Provocraft). Aren't the colors fun? I went with the colors in the digital paper for the design of the card. I printed it on Pure Luxury white cardstock and it looks beautiful. I also used some of the new Pure Luxury Soft Sand cardstock to mat the main image and some white Pure Luxury behind it. I layered the flower and added the little leaf sentiment. Materials used: Stamps-Bug Me Anytime (Gina K Designs); cardstock-white, soft sand (Gina K Designs); digital paper-Bug Me Anytime (Gina K Designs); polka dotted dp (SEI); paper piercing tool; Spellbinders blossom die cut; Cuttlebug (Provocraft); chocolate marker (SU! ); flower punch (SU! ); felt flower (SU! ); brad; corner rounder punch (CM). and, be sure to check out our CenterStage Spotlight girls joining us in Previews today: Carla Suto and Melisa Waldorf . Melanie also has some guest designers working with her set today: Selma, Denise and Dawn. Thanks for stopping by! Another preview coming tomorrow! those papers looks so great on the bug card, I must try them!! Love how you did the scaled down version for the journal! Great tip! Wowwwwwwwww!!!! That journal is exquisite!!!! Gift idea CASEing is running rampant thru my head!!! And how adorable....that whimsical flower is so fun!!! This is the best yet. The cropping and marker ideal is wonderful. I would love to see more like this. Oh that journal is just awesome Cammie! What a neat idea! LOVE it! and wowza on the coloring!! Love the miss you card too, too cute! I really like how you did the sentiment! What a nice idea for the Arranged with Flowers! I love it. And that other card is so fun! Love the bright colours! Great idea! And your card is fun and funky, love it!! Journal is gorgeous! And flower card is so cute! LOVE the flowers! You are so skilled at the shading. They look like you could reach out and touch them! Great job! These are both awesome creations, Cammie. I love the journal/pen set and what a spectacular gift that will make. The colors on your Bug Me Anytime card is FABULOUS. I love the stitching and your askewed image. So hip and clever. Wonderful creations, Cammie! Gorgeous journal cover - outstanding coloring! This will make such a great gift set! And your Bug Me Anytime card is so adorable! The notebook is so pretty, and I like your stitching on the card! What beautiful projects! I especially love the journel! The coloring is just exquisite! Love all the ribbon too! Awesome job, Cammie!!! 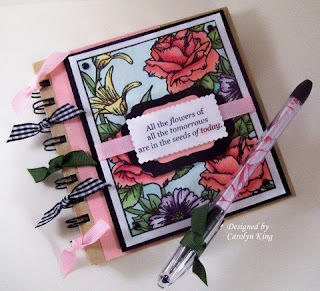 I LOVE that journal and your flower card is adorable! Beautiful journal! Love your coloring and what a cute card using Nina's newest set. So cute!! Love your journal Cammie. I like how you added the ribbons and made a matching pen too. Your bright colored card is very cute. Cammie your journal is absolutely BEAUTIFUL!!!!!!! Wow Cammie~ The floral book is GORGEOUS! The flower card is adorable!! Fantastic job! These are both so wonderful, Cammie!! That note book is just amazing, and the card is just adorable!! Beautiful journal Carolyn. Great gift idea and sweet flower card. Cami fantastic journal project - I LOVE it - right down to the pen, too. Your bug me card is so cute. It's easy to see why you are a Sr. DT gal!!! Both the card and journal are Gorgeous! !...fabulous coloring and thanks for the great tip for downsizing the stamp!! The sketch of the bug card is adorable. What a clever idea to scale down the image for the journal! !